Retired chemist David Jones invites readers into his own creative flashes in The Aha! Moment. And for Jones, who used to write the popular Ariadne column in New Scientist, Nature, and the Guardian, there’s been no shortage of such insights throughout his career: he famously proposed and then actually investigated whether arsenic in Napoleon Bonaparte’s wallpaper could have killed the ruler (Nature, 299:626-27, 1982), and Jones’s phony but fantastical perpetual motion machines still spin at the Technisches Museum in Vienna. Jones airs his theory of creativity, focusing squarely on what he calls the “Random-Ideas Generator” (RIG), a creative center of the unconscious mind. As Jones describes his personal discovery process, The Aha! Moment leapfrogs between vignettes of other thinkers, inventors, and scientists who have bathed in the pure light of discovery. What results is a practical blueprint to bolster one’s own creative prowess, a treasure map to innovative insights. 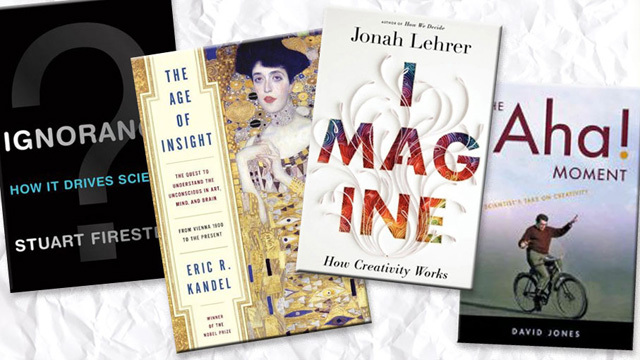 In his latest book, science writer Jonah Lehrer turns the creative mind inside out. Recounting the arcs of insight traversed by luminaries from Archimedes and Aristotle to Lenny Bruce and Stephen Colbert, he dissects the creative process to get to the root of how world-shaking ideas are born. Lehrer deftly weaves information about neuroscience research through stories of creative individuals, featuring brain scientists as well as artists, musicians, writers, comedians, and other thinkers in the throes of creation. Imagine posits that flashes of insight are typically preceded by seemingly insurmountable impasses. Bob Dylan famously “quit” music in May 1965, weary of the pressures and expectations that his meteoric rise to folk stardom had wrought. He retreated to a cabin in Woodstock, New York, guitarless and at loggerheads with his own creative process. Dylan would emerge from his funk to write some of the most famous, controversial, and celebrated music of his career. “Every creative journey begins with a problem,” Lehrer writes. “It starts with a feeling of frustration, the dull ache of not being able to find the answer.” It turns out that the brain’s right hemisphere—pop psychology’s seat of artistic ability or imagination—typically generates crucial connections between disparate concepts in a surge of insight. One wonders if Lehrer experienced such blockage before or while penning Imagine, for the book is clearly the product of a creative and insightful mind. Too often, the public perceives science as the quest for answers—a methodical accumulation of data. Even individuals within the scientific community can periodically slip and buy into this premise. But throughout history, transformative scientific discovery and innovation have been driven not by knowing, but by not knowing. The true “power of not knowing” is the message Columbia University neuroscientist Stuart Firestein preaches in his new book, Ignorance, and one he’s imparted in an undergraduate science course of the same name since 2006. Deconstructing the nature of ignorance, discovering what makes it tick, and discerning its usefulness to the scientific process is Firestein’s goal in the book and in the class. As in the class, Firestein presents case studies of working researchers who use ignorance to propel their science. Cognitive psychologists considering the mental capacities of animals, physicists seeking the unification of quantum and relativistic scales, and others illustrate that great insight often grows in ground copiously fertilized with questions—a lesson that the public needs to learn and that scientists are wise to revisit. Nobel Prize–winning neuroscientist Eric Kandel returns to Vienna, the city of his birth, to explore the cultural capital of Europe as it bubbled over with intellectual vigor at the turn of the 20th century. In The Age of Insight, Kandel describes the cross-disciplinary milieu of Vienna circa 1900, tracing the radical lines of thought from Sigmund Freud’s revolutionary ideas about the prominence of the unconscious mind to the artistic advancements being made by Gustav Klimt and Oskar Kokoschka (whom Kandel collects) and the transformative insights of art historians, such as Alois Riegl and Ernst Gombrich, concerning the role of the observer in art. This collection of thinkers, Kandel explains, would eventually give birth to a more holistic science of the human mind—cognitive neuroscience. By training their focus on how the mind perceives, remembers, emotes, and creates, these turn-of-the-century luminaries married the worlds of science, medicine, and art, and shifted scientific exploration toward the biological nature of mind. Kandel suggests that the marriage is still going strong and calls on the modern-day scientific and artistic communities to embrace the flavor of early-20th-century Vienna to pursue a more complete understanding of the human mind.